fictitious value, 8'= 8 — AQ. Because the horizon vectors for each of the four crossing events in Fig. 11-3 may be calculated (given an a priori attitude and Earth model), utility routine PHASED (Section 20.3) may be used to compute AO. 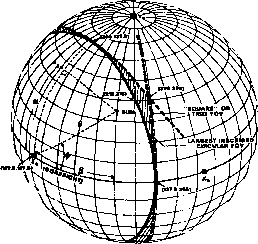 Q' is the width that would have been observed for a spherical Earth of radius p, fixed'at its position at time t, and may be used to obtain an accurate attitude solution. For a spin-stabilized spacecraft, the spin axis attitude is completely described by its right ascension and declination. However, for some spacecraft, a knowledge of the pointing direction of a particular body fixed vector, X, may be required. The azimuth angle measures the rotation of this body vector about the spin axis. For spinning spacecraft with Sun or Earth sensors, this azimuth angle is effectively measured with every sensor triggering. Thus, the calculation of an azimuth angle is trivial.